Documenting the Engrish phenomenon from East Asia and around the world! It’s OK, she’s a cousin once removed. Also do not feed child washing powder. Putting children in the washing machine wont keep families together. If anything it will do the opposite. Klien Child — No matter how many times you turn the shirt inside out, the child is still inside it. No Triangles — You could put someone’s eye out. 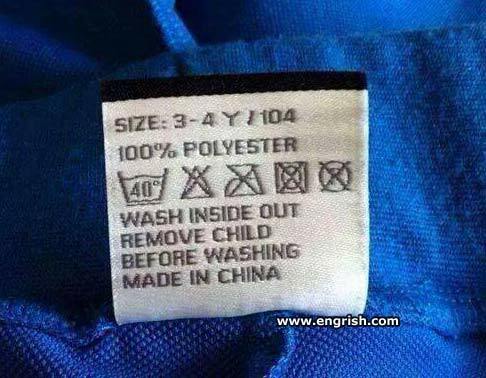 Leave child in while drying to retain shape. You don’t want to be picking heir out of the lint filter. – I’m sorry, sweetie, but this time you’ll have to take a shower. The demographic must be the same parents who leave their kids in a locked car with the widows rolled up in summer. Honey, I shrunk the kid! Remove child inside the outside. Then put outside (BUT NOT CHILD) inside the inside to make it fit to be outside again. I now know what I have been doing wrong all these years.. The girls, Polly and Esther, love to play in the wash tub. Easy job. But wait a minute . . . I need a child remover! So it’s not a “wash and wear” shirt, then? How can I wash my children if I remove them?! I need to give this to my sister. Once she refueld the van with gasoline, completely forgotten that was a petroleum van. I’m very frighten than she put my nephew on the washing machine. @DnT: Honey, I shrunk the Master! The child will dry with the washing. Whats the need to remove it before washing? So, what’s wrong with having a clean child? In fact, good idea is remove all people from clothes before washing in suds machine. I thought EVERYONE just threw children in random household machines, but okay. Jimmy, is that a real tattoo? Naw, it’s just an iron-on. Caption is made at here! Do it here! Do it now! Newsletter - Be the Sign Up! © 1999 - 2013 Engrish.com. All rights reserved.